Green Mountain Grills combines the natural environmentally-friendly use of wood pellets with the technology of using a wi-fi app to control temperature, time, and relay warnings for Green Mountain Grills. Using natural flavor-enhancing wood pellets instead of charcoal or gas is not only good for the environment, but leads to better tasting food and less waste. The Green Mountain Grills Davy Crockett wi-fi portable pellet tailgate grill is the ultimate portable grill. It comes with a digital WiFi controller (control and monitor through our iOS or Android mobile application), a meat probe, a peaked lid for stand-up chicken/ large fowl/ rib racks, a convenience tray with utensil hooks and our new open flame technology grease tray. Also included is Sense-Mate, a thermal sensor which constantly monitors grill temperature. It can run on 12V or 120AC so it’s perfect for home or camping, tail-gating, hunting, house-boating, music festivals or anywhere you can take it! Weighing in at 57 pounds with fold-able legs, it can be placed in the trunk of any car. The ultimate portable Wi-Fi pellet grill that goes everywhere. Great for picnics, tailgates, beach parties as well as the backyard or patio. 12v DC, 9 lb fuel hopper, 219 sq. in. of cooking surface. Folding legs, open flame technology, 150F to 500F temp range, auto start with stainless steel hood. Wi-Fi Controller allows you to adjust the temps right from your smartphone. 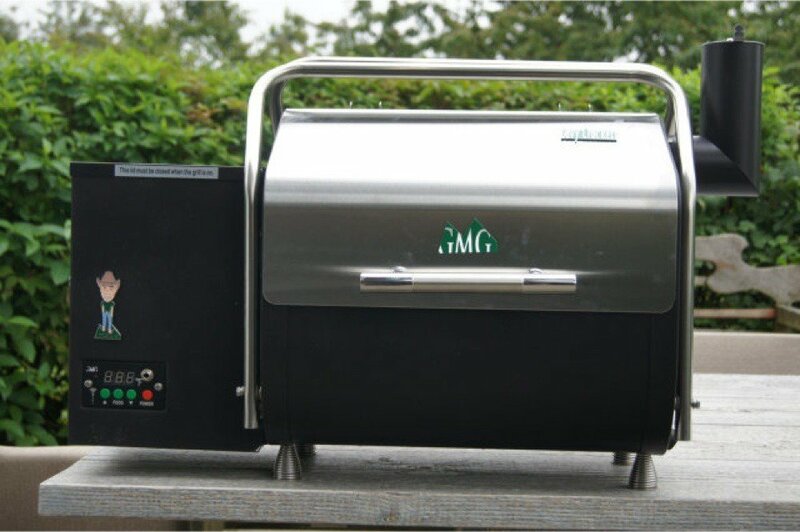 Green Mountain Grills started with the intent to improve upon a basic wood pellet grill, and grew into a business which prides itself on having top-of-the-line grills and grill accessories without the high price tag. A great customer service experience is top priority for Green Mountain Grills, as well as having the best quality wood pellet grills. The temperature ranges for Green Mountain Grills corresponds with the array of cooking abilities they are capable of. Green Mountain Grills are most often used for smoking, barbecuing, roasting, grilling, and searing all types of foods.